Over on the Mailop list (ignore the SSL warning, that is a long-standing issue), people are noting that Google Postmaster Tools has been missing data and/or been glitchy and/or disallowing new domain registrations over the past days. If you had trouble before, you might want to try again now -- a few folks are saying that things seem to be getting better as of today (Wednesday), though it is unclear as to whether or not all missing historical data will be populated. For more on Google Postmaster Tools, start here. 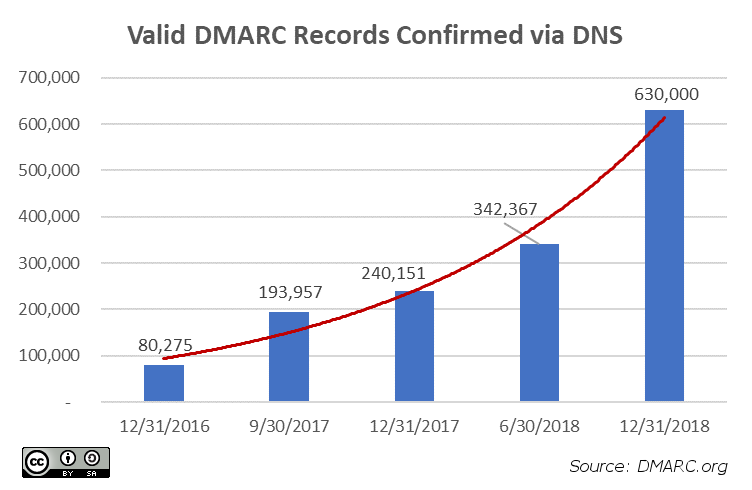 Look at the explosive growth of DMARC implementations! This is great to see. Read more about it over on dmarc.org. Gmail SPF Status of Best Guess: What does it mean? If, like me, you use Gmail to test and check email authentication results, then you're used to seeing SPF results that say pass or fail. But what does it mean when it says "best guess"? What this means is that Google's "faking it" -- they are synthesizing a potential SPF record based on what information they can figure out about the domain. The exact rules that go into the synthesized SPF record are unclear. It could be past email history. It could be that reverse DNS between the sending IP address and sending domain match. Or it could be other things. That's not the important bit. The important bit is this: When Gmail tells you "best guess," it means it can't find your SPF record in DNS. That's a problem, and one you should investigate immediately. In the example above, Gmail is saying that it can't find an SPF record for "b.email.example.com." Google's systems are smart enough to deal with it, so your deliverability to Gmail subscribers is unaffected. But other ISPs do not all have similar "fake an SPF record" functionality. That means that some other ISPs probably will block this same mail due to DNS failures or lack of DNS entries. If you review all your bounces, you'll probably see that this is the case. And it can be a difficult issue to troubleshoot, if you see those bounces, then test with Gmail, and Gmail says that SPF passes. There's little to indicate that something is wrong, except for that magic phrase "best guess." Keep an eye out for it and know that it's a strong indicator of a potential DNS issue with your sending domain. Google just announced today how they've improved spam filtering using TensorFlow. What's TensorFlow, you might ask? "An open-source machine learning (ML) framework developed at Google. These new protections complement existing ML and rules-based protections, and they’ve successfully improved our detection capabilities. With TensorFlow, we are now blocking around 100 million additional spam messages every day." That's a lot of newly blocked email messages. Does it affect you, dear sender? Hopefully not, because Google says that they're "now blocking spam categories that used to be very hard to detect," including "image-based messages, emails with hidden embedded content, and messages from newly created domains that try to hide a low volume of spammy messages within legitimate traffic." This doesn't mean suddenly it is unsafe to send image-heavy emails to your Gmail subscriber base. Google's not about to intentionally start blocking legitimate mail that people actually signed up for. But it does highlight that the closer you get to the edge of best practices -- if you have any practice failings in different areas, you could end up overlapping with one or more of these categories. If so, your messages might actually merit blocking. I'm guessing the chances that it affects a "legitimate" sender are pretty slim, though. But, just a reminder -- "Don't be like Goofus," as the old Goofus and Gallant stores in Highlights for Children used to tell us. Spammers often do things like rotate through newly purchased domains, embed content in unique ways to try to evade filters, and use images to hide messaging from machine filter review. Don't do these things, and I think you'll probably be just fine. 2018: Did I get it right? Just over a year ago I predicted that 2018 would be a year full of mailbox provider consolidation, many folks implementing DMARC, and ISP filtering getting more tougher than ever. Was I right? It sure sounds a lot like what I worked on much of the time last year. Is it too glib to say 2019: More of the same? Because that's my first thought. Provider filters continue to get tighter, DMARC is bigger than ever, and AOL and Yahoo are not quite done merging. I suspect BIMI will grow in 2019, but I feel like we're two or three years out before somebody can declare that 20xx is the "year of BIMI." I know I'll be focusing more on international (non-US) deliverability this year, but it's hard to say if that's just me, that might not be an "industry" thing. What do you foresee for challenges and likely focus areas for email and deliverability in 2019? Remember back in September when I blogged about how to create a Google+ account to make your brand icon display next to your emails when sending to Gmail users? Well, looks like that won't work after a certain point, as Google is shutting down Google+ and will be deleting Google+ accounts and content. I got a notice this morning that says my various Google+ accounts (used for logo display for various email sender tests I've set up) will be shut down on April 2, 2019. I wonder if this means Google will get on board with the BIMI logo display standard? Or there will be some other way to do this? We shall see.